I'm the proud new owner of a Decware Mini Torii. I purchased this amp used here on the classifieds forum and have had it running in my studio for almost a week now. So far I’ve tried a few 6v6 combinations, including the uber-expensive Eclipse-Pioneer/Bendix 5992, and I’ve spent a few hours with some Sylvania 6y6 tubes. But the combination that really works best for me is the Valve Art 350b driven by 12at7s. I’ve had a lot of single ended tube amps through my doors in the past 6-7 years, including six 300b amps that ranged from simple little affairs to full blown WE91a amps, and none of them has had the “magic” the way the Mini Torii with the 350b do. The only amp I currently have that is better sounding in any way than the Mini is a very unusual one–off single ended 71a amp. If Steve ever decided to make a 71a, I’d be first in line. Until then, the Mini Torri with the 350bs is the cats meow. If you haven’t tried the 350B, I’d urge you to spend the $40 and give it a shot. Bottom line, this Mini Torii is a fantastic amplifier. Kevin, congrats! Glad you are enjoying it so much! Hi Kevin! Your story is music for my ears. My M-T should be shipped sometime mid April, and was wondering what tubes to roll once it gets broken-in. There are so many possible combinations (NOS and otherwise), that just picking some of them becomes a difficult task. I know that current production Tung-Sol 6V6's are great, and that the JJ's are pretty good, yet more similar to 6L6's. There's also the NOS RCA black plate and the Brimar 6V6's with great reviews. I was not aware of the ones you mentioned, so definitely will give them a try. May I ask what speakers are you using with the M-T? Tubes usually sound better or not so much depending on analog components' synergies. Any particular brand on the 12AT7s? Thanks for the tips and enjoy your M-T. I'm using Audio Nirvana's 15 inch driver on open baffle, and the Altec 755e also on open baffle. For 12at7 I am using some Sylvania JAN tubes that came with my amp and which seem quite good, as well as some Valvo and Telefunken 12at7. I'll try out some e80cc in the next few days too. I saw your site with the rich audio gear collection, congrats! For one thing, I was not familiar with the Decware Signature Monos, which seem very special. Good to know about the great sound of open baffle DIY's on Nirvana drivers. I was wondering if you have tried either the 12aU7 or 12aX7 driver series in the Mini-Torii. I know these are compatible, and was wondering how much can one reduce the already high gain available with the 12aT7 (1.0 volt for full output), by replacing the 12aT7 with a lower gain driver. Hopefully, these alternatives may not imply sound quality tradeoffs? The signature monos were really nice and were my second tube amp. Great sound, and great looks, but the Mini is better imo. As for the 12ax7/au7, I haven't tried any yet but will soon. The 12ax7 is higher gain though, so if you want to lower it look at the 12au7 or one of its many variants. Nice to hear, probably the added voltage regulation stage on the M-T makes a significant difference. I have great expectations on that amp! Thanks for the info on the drivers, I was not aware the 12aX7 was even higher gain. I'm not even sure the high gain will be an issue, but since my sources are always going to be on the (2+) V, I thought it may help to lower the drivers gain somewhat. We'll see. I suppose the higher the Mu rating, the higher the gain. What would be the sound tradeoffs involved though? Thanks for any tips. I read somewhere that Steve voiced this amp around the 12at7, so I have stuck with that so far in order to have a level playing field while trying various output tubes. Plus, the 12at7 is often cheaper for good tubes like telefunkens, etc, so that is a big advantage if you want to buy a variety of input tubes to play with. 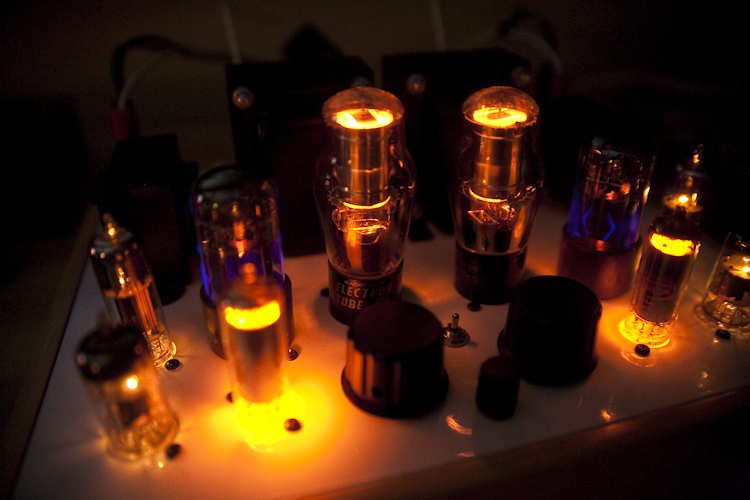 Input tubes often have a bigger effect on the sound than output tubes do. Aside from the gain issues, seems like the logical rolling scenarios would be trying different 12aT7's at a time, combined with compatible output tubes. As you pointed out, 12aT7 variations may probably have major impact on the end sound. This entails a compounded (huge) number of´possible combinations. How are we supposed to narrow down market-available best possible choices, when only a fraction is practically/feasibly possible to test? Are there any specific rules of thumb? The problem is further compounded by the effect of other components in the particular setup. Probably most of the possible 12aT7/Output tube combinations will sound great, but I'm just wondering. The first thing anyone should try on a mini torii is the 12AU7 and the 12AT7 to find out which gain works best in their system. Often it is the 12AU7's. Once you settle on that you can move onto trying different output tubes. And since you have at that point both 12AU7 and 12AT7 it would probably be a good idea to try both with each output tube as you roll. Hello Steve! Thank you for the tip. Could you please tell us what driver tube comes stock as the Mini Torii is shipped (that way I can order the other one in advance)? Thanks again for your assistance. FYI, Upscale Audio has Mullard 12AT7's for a very good price. rolling tubes. There will be one combination that really floats your boat with your associated equipment and when you find it...stick with it. Just MHO. I am going to call Steve tomorrow and hopefully order a Mini Tori as I think it will be a good match for my speakers. I'd agree, except how do you go about finding that particular combination? I would suggest to ask Steve for likely robust, particular brands' driver/output tube combinations, he may feel will be adequate for most settings. For example, a particular brand 12aU7 with a synergistic 6_6 output tube he knows works in most cases. Same with the 12aT7 (you need both due to possible gain adjustment with your own setup). This insight will bypass the never-ending trial-and-error process involved, or at least limit it significantly. I'll certainly encourage you to go with the Mini-Torii if your listening context suits its character and specs. It is the ideal in my case, and I'm eagerly waiting for its arrival. BTW, if you get those combinations from Steve, please don't hesitate in publishing them here! I have quite a few tubes and will post my subjective results when I get the amp. Good advice about going slow with the tube rolling. I always think it's good to listen to the stock tube sets, in general I find them on target and quite suitable. Also we all have different rooms, sources, speakers and tastes (or ideas of what is "neutral" perhaps) and one man's recommendation is not necessarily the best for another. I've more often not been crazy about the most popular NOS tubes or even the most recommended tube types. There was a time some years back I got so deeply involved in tube rolling that I lost sight of the basic sound I needed. Tread carefully. Can't wait until you folk have your amps and are babbling ecstatically about the sound and the music! I personally prefer the Mini essentially due to the input/output tube voltage regulation stages: Not a trivial enhancement IMHO. I will definitely break-in the amp in stock configuration first. Probably that will be enough to confirm if the original design voicing suits my tastes/needs/setup. Then, we'll see. I agree with both of you, tube rolling may become an obsession without convergence. I've noticed the number of M-T units sold per month is lowest relative to the other amps, especially the Torii MKIII and now the SE34i.3. In effect, it is a special niche, both in conception as well as flexibility. Thanks for your good wishes, Lon. Erik, thanks so much for your Mini w/ Klipsch feedback! Much appreciated. FB-If the Mini is that good with older Heresies, it should be even better with your slightly more sensitive HIII. I am going to go for the Mini Tori. I don't head bang any more and a few good watts is all I need. The H3's are actually very good...there is no 'perfect' speaker. It looks like the Mini has two sets of input jacks and one subwoofer out. Is that correct? Keeping in mind every impression put forth is subjective, the synergy with the Heresies is very near perfect. But then again, it was also pretty attention grabbing and very musical with our La Scalas. I don't have H IIIs, however. I listen to very different music genres, and can listen intently to classical guitar or acoustic jazz and switch to heavy metal quite comfortably -- and with the harder stuff we go to the La Scalas. For which, based on how good the Mini Torii is, we may be investigating the higher horsepower of its bigger brother. I'm also craving to do another amplifier project, so may end up making something on my own. My feeling, though is that the Zen Torii is a special amp. Eric, Thanks for the input on the Mini/Heresy. I am driving the H3's with a 5 watt Almarro 205 and have no issues so the 4 watt Mini Tori will be fine. Thanks for the tip on the 6f6! I’ll have to pick out a pair and give them a try too. I’m still using the 12at7, but will sub in a 12au7 and several of its variants at some point in the near future. I’m primarily listening to three output tubes now; the 6bg6, the 5992 and the 350b, and each of them sound so good I could just stop here and be happy too. But tube rolling is a whole hobby unto itself! You are certainly right about the 2a3 and 300b tubes! I do happen to like both of those tubes quite a bit, as well as the 45 and 71a, but the price to value rating is quite low there. Consider that a pair of 1953 new in box Western Electric 300bs sold on eBay last week for a cool $5000 dollars! So one single tube (admittedly the holy grail of the SET world! And possibly a very good financial investment in and of itself) cost more than a brand new Mini Torii complete with a Decware power cord, Decware interconnects and a nice variety of NOS American input and output tubes…shocking really. In my experience at least, this little Mini Torii sounds just as good, and in many cases, quite a bit better than any of the other SET amps I have experience with. Overall, I think the output tube’s pedigree becomes less important when it is on a base as solid as this amp is. There are certainly differences in the presentation between one type or even one brand and another, but often those differences are rather subtle and neither can be said to be clearly better or worse. Always it is subjective between listeners, rooms, and other components. In this amp, it is my feeling that it will be hard to find a compatible tube that sounds bad, and many will find that the stock 6v6 configuration is miles ahead of whatever they may have heard in the past. And we know that the price of a good set of NOS American 6v6, or 6l6, or 6bg6, or 6f6, or 6y6, or 6k6, etc is far less than even a cheap Chinese pair of 300b that may or may not sound good and may or may not last beyond its 30 day warranty. Just my opinion of course, but I think a lot of the sound quality here has to do with the Decware output transformers, but even more than that I think it is the tube regulation. I’ve had tube regulated power supplies on an amp before, and that makes a big improvement, but what has been done here is certainly a large leap beyond that! At any rate, the wide tube rolling capability, using many tubes that I already owned, combined with a past positive experience with Decware, are the reasons I chose this amp. I’m a tube roller! And for me, this amp offers the ability to have many amps in one package, and they all sound excellent. Very, very nice. Please keep us posted on your “third channel” Mini Torii project! I just ordered one. I have had a few very good SET/SEP amps in the past. The Mini just has supreme flexibility and I am sure I will enjoy it. Thanks...it's only 12 weeks in solitary...confinement...bread and water. "It's a tubed erector set for audiophools with OCD. 8-)"
Yes! But this one is actually affordable to roll tubes in...more audio and less fool! I agree. I have had 300B's 2A3's and 45's all nice but not near as verstile as the Mini. Just bought a pair of Valve Art350B's for $50 delivered. There is a pair of WE 350B on the auction site for a paltry $3000.00. Do you still have your MHDT Labs DAC? I have a Havana and it is a keeper. Yes, I do still have the MHDT DAC. I love it! Four or five years now of almost daily use. But, I'll admit I'm thinking a lot about the new DAC from Eastern Electric. Now I can sell a spare amp or two to finance one. Florida Boy: totally agree with your post. I've gone nuts comparing not just tubes, but capacitors, resistors, output transformers, chokes......and forgot to listen to the music! Compromised design better, nor will more expensive valves. What the mini torii also illustrates is that OPTs the size of arc welding machines are not required for outstanding and comprehensive frequency response -- though they do need to be suitable for the load to which they're connected. I admit those 350Bs must make a very nice visual statement in addition to sounding great. I have spent not only a bit more but hugely more on a pairmof 2a3s or 300bs (as I'm sure you guys have seen, as well) for the amps I've made, so the cost of your 350bs is a bargain in comparison! "Florida Boy: totally agree with your post. I've gone nuts comparing not just tubes, but capacitors, resistors, output transformers, chokes......and forgot to listen to the music! " Been there too and got the T-shirt. I found that I was listening to 'sounds' instead of music. The internet fueled the fire. For the most part I've learned to trust Steve to get the bedrock just right. After that I just tailor to my room and tastes. (And though I've learned to trust a number of ears here, my first allegiance are to my own left and right!) A winning formula: Steve + my personal experience=sonic joy! And this formula has been producing great results for you in the last ... how many ... 14 years or so? That's about right. Not going to mess with a good thing. All true. It is very easy to get sidetracked and begin to listen to only the gear. But when that special combination is achieved and you hear a track you know really well in a brand new way...wow. When you have a Swiss army knife it seems like a shame to use only one blade. And with the prices for great output tubes for this thing being as low as $8-$10 in some cases...less than a pizza. Easy enough to try many combinations and settle on the one (or two) that sound best to each individual. Erik, the 350B is not such a visual statement, it looks pretty much like a 2a3 tube, but the 6bg6 is an eye catcher. And here's a snap with the Bendix 5992 glowing purple. Nice tube, but not worth the current prices imo. Nice pic! When I first looked at the Mini my initial thought was 'Swiss Army knife'. I am a recovering tube rolling addict...this amp is not going to help but the cost of a fix will be a lot less. I will burn it in with the stock tubes though. Do you find the amp to sound neutral, warm, cool etc.